Building a new organ for a church towards the end of the 20th century presents, perhaps, more of a challenge to an organ-builder than ever before in history. Two or three decades ago, the likelihood was that the instrument should follow the strict edicts of the Classical Revival movement. In the meantime, the appreciation of the organ has widened considerably, and organists require instruments which play a large and varied repertoire. 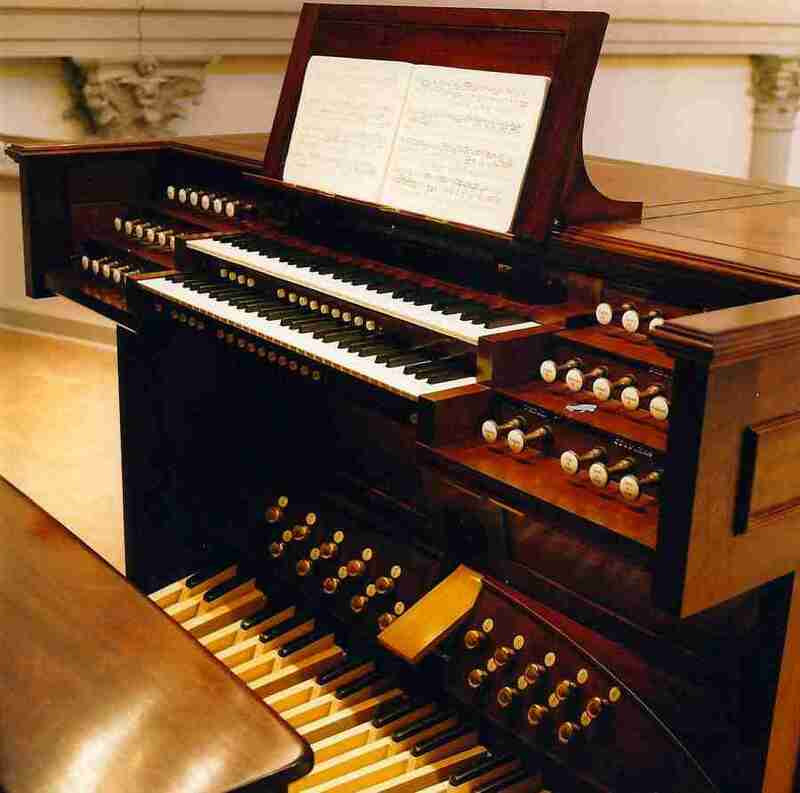 Couperin and Bach, Liszt and Messiaen feature in most organists' repertoire almost universally, and they look for instruments that provide them with the vehicle allowing them to express the widely differing moods and sonorities the music requires. This is no easy task in itself but, at the same time, the liturgical requirements also have to be addressed adequately, both in the accompaniment of the congregation and a choir if there is one. There are different ways in which this seemingly impossible task can be accomplished. One often explored in the past is to combine the typical tonal characteristics of different schools of organ building into one instrument. This has been done with a modicum of success by a number of builders but there is always the danger that the result is a collection of smaller instruments masquerading as a larger one. The task is obviously made easier if the instrument is a very large one but in most instances, as here at St Agnes, the organ has to be of more modest proportions. For St Agnes we approached this problem in a different way. Rather than trying to combine registers that did not relate to each other and may not even speak the same language, we took a single starting point and developed it to be more versatile than the point of departure might be in itself. 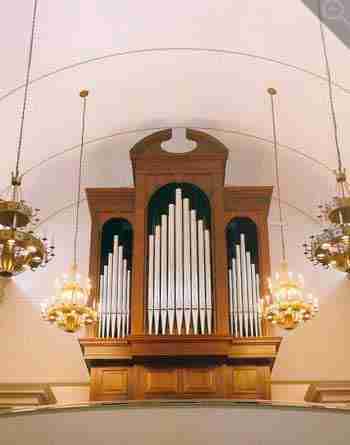 There are a number of such departure points which lend themselves to this treatment, and in this instance we took the English organ of the mid 19th century which, in many ways, demonstrates similarities to the instruments of Hook and Hastings, one of the pioneers of American organ building. The result is an instrument which has already drawn praise for its versatility from all the organists who have played it. The Church of St Agnes is on 43rd Street East, very close to Grand Central Station. Its congregation is made up of a wide cross-section of society. Many are people who work in nearby offices, and the church has a constant flow of people coming in and out all through the day. On 10 December 1992, a fire started in one of the towers and rapidly engulfed the whole church. The organ tuners who were working on the organ at the time only just managed to vacate the building, leaving all their tools and personal belongings behind. The church was razed to the ground, and with it went the somewhat altered Skinner organ. It was not long after the disastrous fire that we were invited by the then organist, Dennis Crowley, to make some proposals for a new organ. As time progressed, further discussions ensued with the present organist Richard Porterfield and the church's advisor, Barbara Owen. This exchange of ideas is always enjoyable, as different ideas and perceptions are discussed and their relative merits and implications for the overall character of the organ assessed. It is not an easy task and requires vision and flexibility on the part of all concerned. One has to try and envisage the sound the instrument will make, and how the various stops proposed will combine, but sounds are even more difficult to describe and evaluate than colours, of course. Ultimately, the specification was agreed,, and it was not very different from that originally proposed but some modifications were incorporated which undoubtedly enhanced the final result. It was intended from the start that the instrument should display the brightness still fashionable in the middle of the 19th century before the advent of the heavy diapasons which characterised the organs of both England and America later on in the century. However, the scheme was developed to afford the instrument slightly more character than even the best mid 19th century instruments generally displayed, mainly to enhance its flexibility. At that point the task of translating the ideas into wood and metal begins. Many hours of work ensue in the fixing of the scaling, the detailed design of the instrument and then its construction, which for this instrument amounted to a little over 12,000 hours. Organs are still not things which can be built quickly. Finally, all the components were ready for delivery, and the work could begin in the church itself. St Agnes is an exceptionally busy church, every day of the week, but the daily services still had to take place whilst the construction in the church proceeded. Organ-builders and worshippers kept a difficult, but fruitful, peace, each recognising the needs of the other and making compromises as the work progressed. Gradually the church, which looked more like an organ builders workshop just after we had arrived, began to look like a church once again as the components were installed. Finally, the voicing and tuning process began, which was probably the most irritating for the congregation and particularly for those coming into the church seeking a quiet contemplative moment. Many people must have asked themselves how these apparently inharmonious sounds could ever unite to become a musical instrument. But, as is well known, this is the most crucial part of the whole exercise. It is at this point that each individual pipe - and there are over 2,000 of them - is attended to and "voiced" to ensure the result is indeed musical. Not only must each pipe relate to its neighbour in the same stop but each stop must relate to the other stops in the organ, and the three departments to each other. This is of necessity a time-consuming operation but we hope that the patience of the worshippers at St Agnes was justly rewarded. The organ has 32 stops and mechanical action to the keys and pedals. The console (which cannot be seen from the floor of the church) is reversed, so that the organist can direct his choir, and indeed sing with it, as is the practice at St Agnes. The drawstop action is electric with a 64-level capture system, and the blower is of course also electric. The casework was designed to enhance the Romanesque interior of the re-built church and is to our own design. The Swell Organ is above the Great and the Pedal Organ is either side. Fortunately, the church authorities and the architects heeded the advice of the consultant and ourselves, and the acoustic is extremely good, enhanced by the lofty proportions of the building. The organ was opened on 5 October with a gala concert performed by Kent Tritle, organist at St Ignatius Loyola, and Gerre Hancock, organist at St Thomas Fifth Avenue. 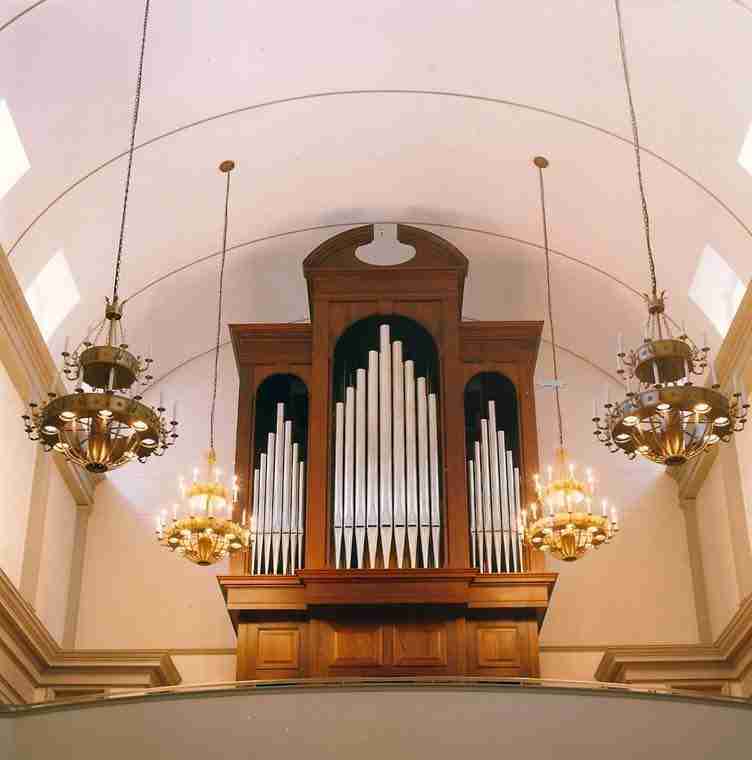 View the Specification of the St Agnes RC organ (completed 1998) and pipe scales.